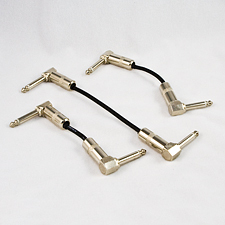 Ultra IC00P GS4 is our finest effects pedal & pedal board cable. These are made with your choice of 90 degree or straight 1/4" connectors and with very flexible 22 gauge Canare GS4 Insturment Cable. The Canare GS4 is excellent cable for pedal board cables because this is extremely flexible cable with small 4.0mm outside diameter. The cable is very low capacitence providing a very natural/transparent sound. Great cable, durable jacket, braided sheild and professionally assembled. Only available in black cable with black shrink tube. Now available in lengths as short a 6 inches!! Please visit our Patch cable page for instructions on measuring your patch cables BEFORE placing your order.